Tuffet Making - Show Me WOW! Little Miss Muffet sat on a tuffet, but no spiders here I am glad to say, only bookworms! 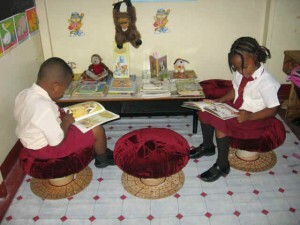 Book Nook tuffets for free! 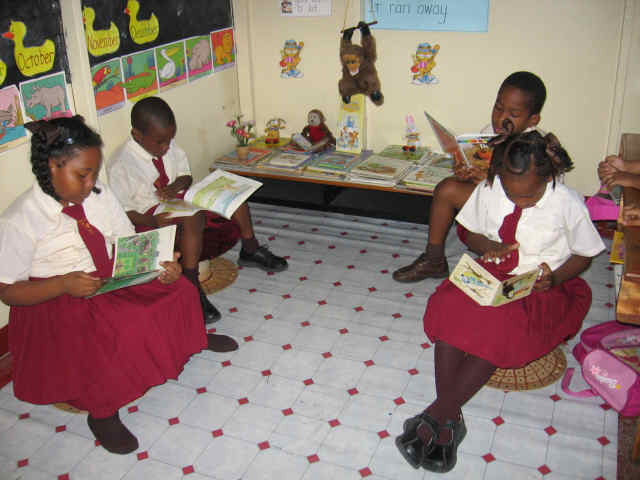 It is possible and fun to make little seats for the smallest of school children from the empty wooden spools, some fabric, stuffing for the padded seat and coloured pencils, crayons or paints. Dominica’s Cable and Wireless kindly supplied the ones photographed here, and they are now revamped and currently being used in school Book Nooks, or some are in the process of being converted from something that was about to be trashed, to very popular tuffets. 1) Put the empty spool flat on a piece of fabric (any colour as this will not be seen later), and draw round it. 2) Cut this fabric out an inch or two away from your drawn line, so it is bigger than the spool circle. 3) Cut a second piece in exactly the same way. These two pieces are the two sides to the cushion. 4) Sew these two pieces together leaving an 8 inch gap unsewn. 5) Turn this right side out and stuff the cushion, sewing up the 8 inch gap once the stuffing is in place. 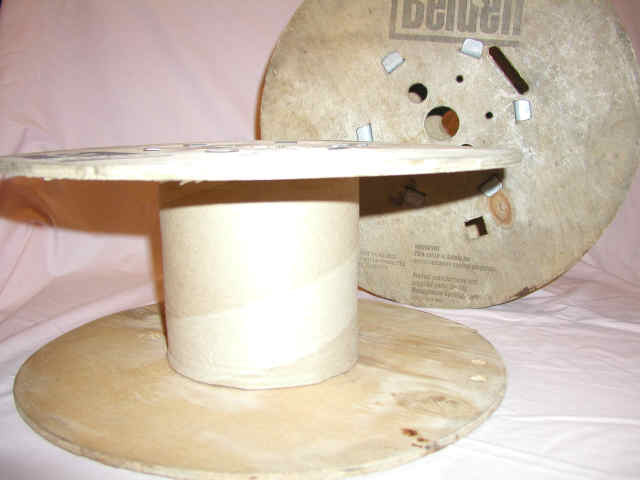 6) Using the fabric of your choice, (this will be seen in the finished article) put the empty spool flat on it. 7) Draw a line round it as before. 8) Cut out this circle two or three inches away from the drawn line, so it is bigger than the drawn circle. 9) Hem round this and through the hem thread cord, string or elastic. so it holds the cushion firmly in place. 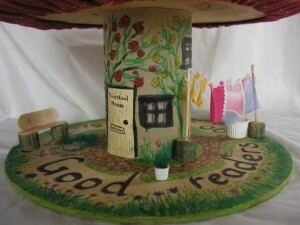 11)Decorate with wax crayons, sticky paper, felt pens, corks, lollipop sticks, cut out flowers etc. 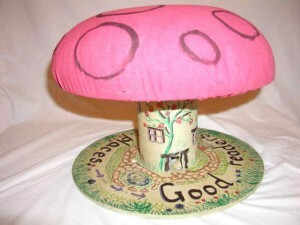 A red topped tuffet with circles drawn on the red fabric can look like a toadstool. The central cylinder can be drawn on to become the house, the flat area on the floor can be the garden. For a washing line, you could push two thin sticks each into a half cork for the line poles. If you sew some fabric shapes on a thread before you attach it to the sticks, you have a line full of washing…a pair of pink and blue curtains, a pair of yellow socks, a pink bath towel. 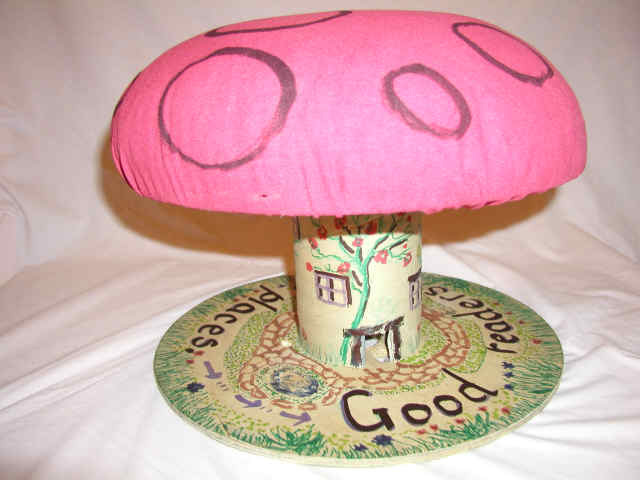 You now have a lived in toadstool house tuffet. Toothpaste tops make flower pots, green fibre from a scouring pad make plants, the washing basket was a plastic milk container with some squares of fabric stuck in it. Lollipop sticks make garden seats with half corks for the legs…or the sticks could make a ladder to clean the windows. You could add a stone edged path, a sellofane garden pond and on and on. 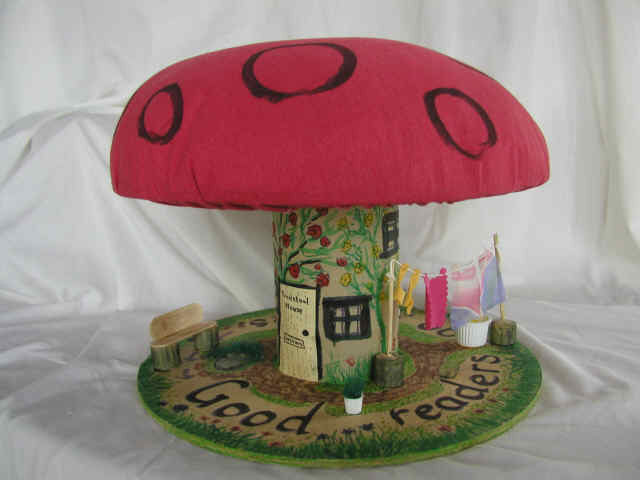 By encouraging children to look out for things to recycle for this toadstool tuffet you are encouraging all sorts of learning. You can also use the toadstool house as a stimulus for creative writing. Who lives there? What do they do all day? 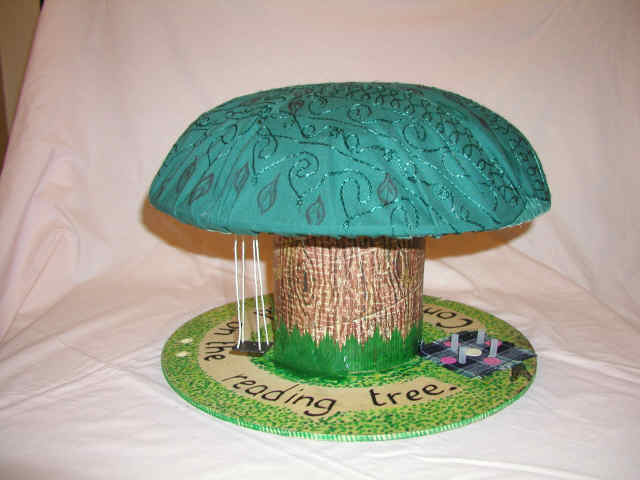 A picnic-under-a-tree tuffet says, “Come and sit on the reading tree”. A green topped tuffet with leaves drawn on the fabric can look like a tree.The spool cylinder can be drawn on with different shades of brown wax crayon and brown felt pen, to look like bark and, on the flat ground area, a small square of fabric can be stuck to look like a picnic table cloth with paper plates and with pieces of plastic drinking straw cut and stuck in place to look like drinking beakers. A vinegar bottle top makes a basket, with a wire tag making the handle, and with 4 chick peas stuck inside to look like bread rolls. Four split peas stuck on the central paper plate look like biscuits. A small plastic square cut from a bottle, with a hole pierced in each corner and threaded with string becomes a swing to hang from under the tree boughs. You now have a picnic tree tuffet. 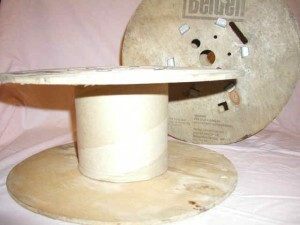 You could add a see-saw made from a cork with a lollipop stick stapled to it so that it see saws. But where have the people gone? They were just about to eat when they rushed off. Have they gone to fly a kite, or did they hear an accident? Imagine the creative writing that can come from this tuffet. make a beach scene, with sandpaper for the beach, or sand sprinkled on a coat of glue,a tube top and tiny wire handle for a bucket and a trimmed lollipop stick for a spade. Add some fabric for a towel and a vinegar bottle top with a wire tag handle for a picnic basket. Dried chick peas in the “basket” look like bread rolls, lentils on a small circle of paper look like a plate of biscuits. Each novelty tuffet can be used for creative writing and what fun that would be! No need to wonder why! Oh, and have a rota of children responsible for the Book Nook, so that it always looks inviting. Make them a badge to wear so everyone knows how special they are.